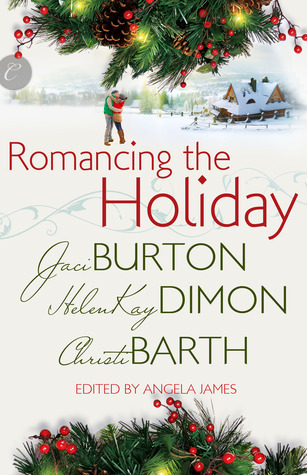 The Deal: Romancing the Holiday is a 3 story-anthology, so I'll summarize each of them separately. In We'll be Home for Christmas by HalenKay Dimon, we meet Lila and Spence, two people who had a 3-day hook up a few months ago and then unexpectedly run into each other again when Lila moves into Spencer's town to manage a lodge a relative has left her. Spence and Lila haven't forgotten about each other, or their explosive chemistry... too bad Spence gave her his brother's name when they first met and now Lila is none too pleased. Ask Her at Christmas by Christi Barth is about Kyle and Caitlin, who have been best friends forever. Caitlin has also been in love with Kyle for years but not willing to risk the friendship, not even when Kylie announces the sudden plans to marry a woman his father has selected for him, and asks Caitlin help planning the perfect proposal, unaware that her heart is breaking. Finally, The Best Thing by Jaci Burton is about Tori who works for the Kent Brothers in their construction company (apparently there are other novellas about the other two brothers) while struggling with her crush on one of them: Brody. Last Christmas, Brody kissed her and that sent the office dynamics into a bit of a tail-spin, until it got so bad that the other two Kents demanded Brody make things right with Tori, prompting them both to act on their latent feelings for each other. My Thoughts: Romancing the Holiday was a mixed bag of nuts. I flat out didn't much care for the first story - We'll be Home for Christmas - I didn't particularly like the characters or care for what happened to them, and the whole thing was a little childish. I enjoyed reading Ask Her at Christmas a lot more, I found the story fluffy and sweet even if the conflict was a bit silly and it got solved way too easily, and both Caitlin and Kyle were kind of wimpy. I liked the core of who they were. I think that if that had been more developed it would have been a sweet story, as it was it had a lot of potential and it was fun to read but far from perfect. As for The Best Thing, it was certainly fun to read - probably the better story out of the three - and I actually got very intrigued about the other two Kent brothers and I look forward to reading their novellas (apparently I already own them in two different anthologies I got last year and that I haven't read). I liked Tori and Brody, and I could even understand what drove Brody to do certain things - his family could be fairly annoying sometimes - but I didn't like how the conflict was resolved so that kept the story from being a total winner. As an Anthology, is not bad, I think it averages three stars all in all.